Up for your consideration is the perfect pattern just in time for summer, Clam Bake for 17" DeeAnna Denton. 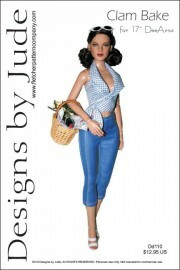 The pattern includes a halter top with bow and crop pants with side insets and back snap closure. This design is also available for Tyler Wentworth dolls. The PDF prints on A4 and 8 1/2 x 14 legal size paper. Notions: Matching thread, 5 snap sets, matching bias tape or binding for pants waist.